Chris McFadden, CEO of NxGold, sits down with Maurice Jackson of Proven and Probable to discuss his company’s exploration efforts on two continents. 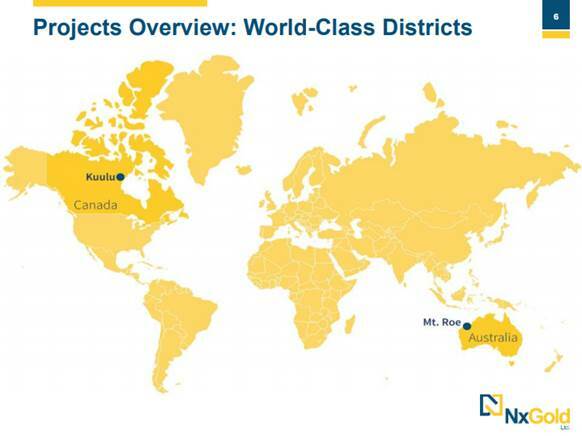 Proven and Probable: Joining us today is Chris McFadden, the president, CEO, and director of NxGold Ltd. (NXN:TSX.V), where the focus is on high-grade gold in world-class districts. Mr. McFadden, in our previous interview, we conducted a thorough, comprehensive interview regarding the value proposition of NxGold. For current and prospective shareholders, please read our in-depth exclusive interview published in September. Mr. McFadden, for someone new to the story, who is NxGold and what is the thesis you’re attempting to prove? Chris McFadden: NxGold is a Vancouver-based gold explorer. Our main objective is to discover high grade large volumes of gold in first-class jurisdictions. So currently we have projects in Canada, projects in Nunavut and also in Western Australia in the Pilbara region. Proven and Probable: I want to begin our discussion at the 10,000-foot level and get your perspective on a topic that has a number of speculators’ attention and that is the discussion of peak gold and how this may serve as a catalyst for junior mining companies and, in particular, NxGold. Chris McFadden: I think that’s a great question because I think what we’re seeing in the industry at the moment and it’s something that’s been coming over the horizon for a few years now is that the majors have really cut back their exploration. They’re not spending the volumes of money that they used to spend on exploration for new gold deposits. So, over the last 5-10 years, actually there’s been a dearth of high-class, large-scale gold deposits and the majors are huge drop off in their production, in my view. You look at some of the production profiles for the big companies and gold production is going to potentially drop significantly in the years ahead because there hasn’t been that money spent on exploration. So for companies like us that are exploring, that are spending money in the ground pursuing the next great discovery, I think there’s great potential there because if majors want to grow and stay in existence they need to look to juniors like us who are actually doing the work and opening up new teraines. Proven and Probable: In our last interview you shared the next unanswered question for NxGold will be the implementation of a systematic approach to exploration and the anticipation of drill results. Since then NxGold issued three important press releases. Beginning with the 10th of September (Press Release) the company received and compiled assay results, preliminary mapping, trenching and lab analysis from the stream sediment samples. Share the details with us. Chris McFadden: The company adopts a very systematic approach to its exploration. So we’re starting with very basic style exploration with stream sediment sampling, some trenching and grab samples. 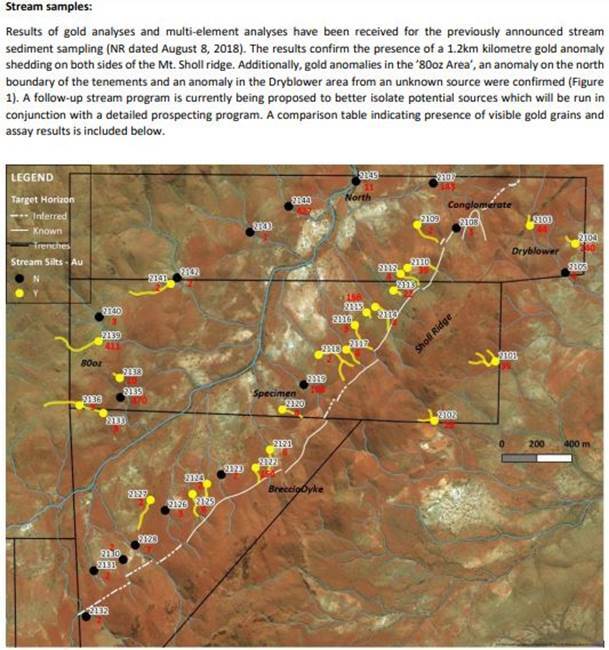 So that release from September was the output from the first phase of work at the Pilbara Project in Western Australia. One of the key highlights was in some of the trenches we opened up we had a visible gold in a specimen; after assay there’s 102 grams of gold in that specimen, also some silver, which was interesting as well.So that first pass work was a fairly random sediment sampling process. But those results were in that release. There were a number of other interesting results and in some of the sediment samples we took there was visible gold as well. So, obviously there’s some gold on the property and this highlights that for us. Also it was very interesting because on the ridge we have on the southeastern side of the property there was consistent and numerous samples of an extended length of approximately 1.2 kilometers where there was visible gold in the stream sediment sampling. So that encouraged us. As I think I said in our original interview, each exploration dollar needs to be justified by success in the results that we obtain. So that encouraged us to proceed to continue our exploration work in the Pilbara Project. 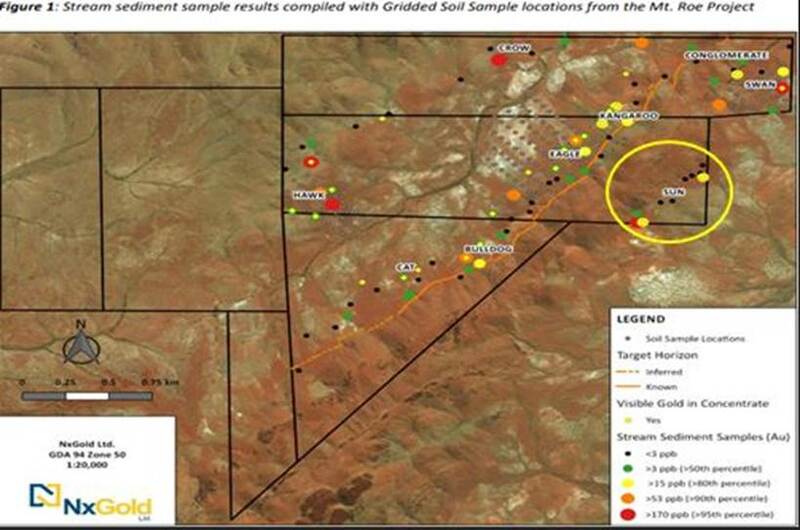 Proven and Probable: On the 15th of October (Press Release) NxGold discovered a new vein exposure on the east side of the property called the Sun Target Area. What can you share with us? Chris McFadden: Well, the Sun area is right over on the eastern side and is on the other side of the ridge if you’d like. So, from that first release and subsequent release will say that a lot of the attention is on the western or northwestern side of the ridge of the property. Sun is over the other side in the area where we haven’t previously done much work. Where there also wasn’t much connectivity from prospectors. So it was a bit of a punt on our part to go to the other side of the ridge, but we’re looking to see what happened on the other side. We were very encouraged to find some bits of good results from that side. Also, to find that vein on that side because what we’ve seen on the northern, or nort western side of the ridge with our trenching, also with mapping, is that there are considerable numbers of veins. It’s really exciting that they’re continuing on the other side of the ridge. Also on that side of the property we’re much closer to the Artemis Resources grab and we know that it has been finding some good veins and good nuggets on its property as well. So it seems that with that result that there is some extent potentially to the system in this area. Proven and Probable: This week NxGold issued a third and equally important press release regarding follow up work on stream soil and rock grab samples. What has the company excited here about the latest findings? Chris McFadden: What’s interesting from this latest release is the consistency of the results we are obtaining and that’s it’s confirming our earlier work that there is a primary source of gold somewhere here on this property. So it’s highlighting the key prospects on the property that we’ve been working on in the Sun, in the areas we call Eagle in particular and Hawk. So the particular areas of the property, Eagle and Swan and Hawk, where prospectors have been finding nuggets for a considerable period of time. So the results tell us that there is a primary source of gold here and we’re narrowing our focus down onto those areas as a result of this work. Proven and Probable: Switching gears, multilayered question, what is the next unanswered question for NxGold? When should we expect results? What determines success? 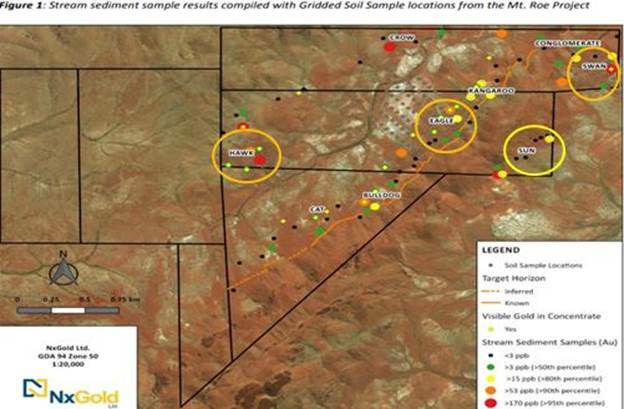 Chris McFadden: As we reported in our last press release, we have undertaken some very systematic grid soil sampling at the Pilbara Project in the Eagle, Swan, and Hawk areas. So it’ll be really interesting to see what comes out of that systematic soil sampling process. We have something like 140 samples in total on those areas that we’re expecting results from very soon, hopefully in the next week or two at the latest. That will give us a really strong indications of where the primary source of gold is we hope on this area of the property. So it’ll be really exciting for us and really interesting because we can then use that very systematic grid soil sampling and combine it with our stream sediment sampling and our trenching rock chip sampling and the magnetics that we’ve done over the area. We’ll have multiple layers of geological information that we can then interrogate to ensure that we have a really strong picture of what’s going on under the ground here at the Pilbara Project in Western Australia. Another interesting or exciting element that’s coming over the horizon is we’re very hopeful that the remaining licenses in this area, which have been under application for the last 12 months since we acquired the property, we’re hoping that they will be granted to us again in a very short term. That will also allow us to extend our exploration efforts in the Pilbara Project area, particularly we’ve been working right up to the edge of the boundaries there at Hawk. We’ve done the systematic soil sampling pretty much right up to the edge of the granted area. This will allow us to move then into the application areas and effectively almost double the area that we can work at the Pilbara Project. So in terms of what amounts to success from this project and the work that we’re doing and hopefully soon to announce, it’ll be the identification using the systematic multilayer approach to exploration that’ll allow us to narrow our focus on target it on areas for the next stages of work. Proven and Probable: Last question here for you, what did I forget to ask? Chris McFadden: Well, as usual Maurice, your questioning is very in depth, but one thing we haven’t spoken about is the Kuulu Project in Nunavut. That’s still a project of great interest to us, but we continue to be unable to obtain the surface license that we need. But we continue to work with the communities there and are working very hard to try and find a solution to that challenge that we have. But we’ve been very patient there because that has the potential to be a truly world-class exploration project. Proven and Probable: Mr. McFadden, for someone listening that wants to get more information about NxGold please share the website address. Chris McFadden: Certainly, it’s very simple. It’s NxGold.ca. Proven and Probable: As a reminder, NxGold trades on the TSX.V symbol NXN. For direct inquires please contact Travis McFearson at 604.816.2686. He may also be reached at [email protected]. NxGold is a sponsor of Proven and Probable and we’re proud shareholders for the virtues conveyed in today’s interview. Last but not least, please visit our website www.provenandprobable.com where we interview the most respected names in the natural resource space. You may reach us at [email protected]. Chris McFadden of NxGold, thank you for joining us today on Proven and Probable.